SLAY ALL DAY. THEN ROSÉ. WHERE THERE’S A WILL, THERE’S A ROSÉ. FIFTY SHADES OF ROSÉ. Those are all pretty goofy, sorry, but, seriously, we CAN drink rosé as if it was life-giving water….right? Yeah, thought so! This is our ALL-TIME favorite that we import direct from Provence, and it is a fantastic, complex and uber-refreshing wine at a shockingly amazing price. LOAD UP! 2017 is a small vintage in Provence, so there is a lot less than last year (even though we kept the price the same for ya…). Did you see the price, by the way? C’mon!!! 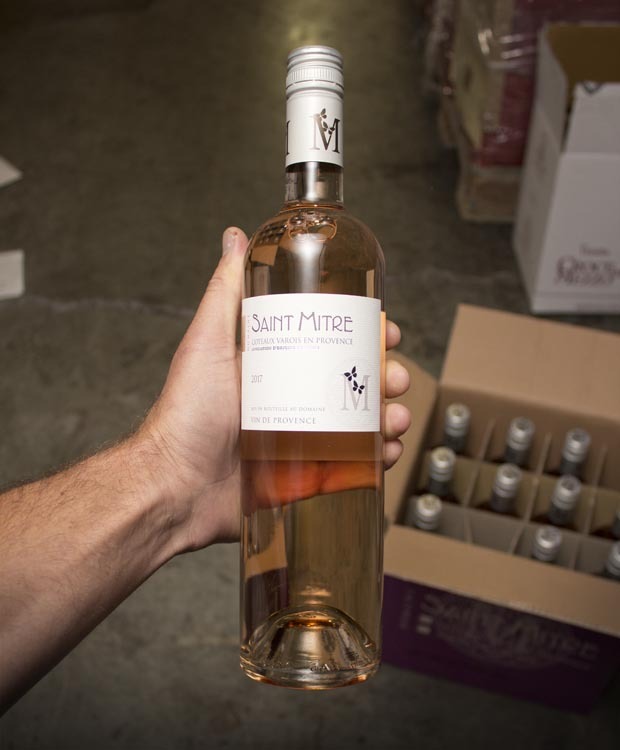 Domaine Saint-Mitre is a 30 hectare family estate located in Saint Maximin la Sainte Baume, in the Var region, and we are incredibly lucky to be one of the only importers into the U.S. Drinking this wine is like therapy. We relax, we loosen up, we REGALE in the superb easy-drinkingness of it all. Who knows? We might just go skinny-dipping tonight. Strawberries, of course (that wonderful whiff of strawberry is absolutely mandatory), a dash of rose petal perfume, a hint of white peach….it’s all there in that also-must-have RACY, mouth-electrifying freshness!! AAAAH! Love it!! Will go mighty fast! Domaine Saint Mitre, in Provence, has a vineyard of 35 hectares which extends in front of its bastide dating from 1817, with a magnificent view on the massif of Sainte Baume. The unique terroir of Saint Mitre is known for its exceptional sunshine, its ideal location in Provence, and the richness of its clay-limestone soils. They have a large portfolio of Provençal varietals : Syrah, Grenache, Cinsault, Rolle, Ugni Blanc but also more atypical varietals: Viognier, Marselan, Merlot and Chardonnay. Their production is often oriented towards the rosé and white wines which are recognized for their elegance, their freshness and their aromas of fruits (citrus fruits) and flowers. The cellar, dating from the late nineteenth century (1898), has been completely renovated and equipped with ultra modern tools and equipment to optimally vinify the grape juice that they produce each year. They also attach a very important point to the quality of picking our harvest and are very vigilant about the quality of their pressing. With a capacity of 3500 hectoliters, the winery is made up of stainless steel vats and renovated concrete vats which are thermo regulated. This mastery of the temperatures during the fermentation allows them to elaborate rosé wines of a very clear color and to produce aromatic wines and endowed with a very beautiful freshness.